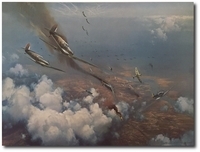 Overall size: 36" x 25 1/2"
During the winter of 1944- '45, the skies over Germany would routinely be studded with literally thousands of allied aircraft on "RAMROD" missions, a term used by the USAAF for long-range strategic bomber strikes with fighter escorts, flown from their bases in England. 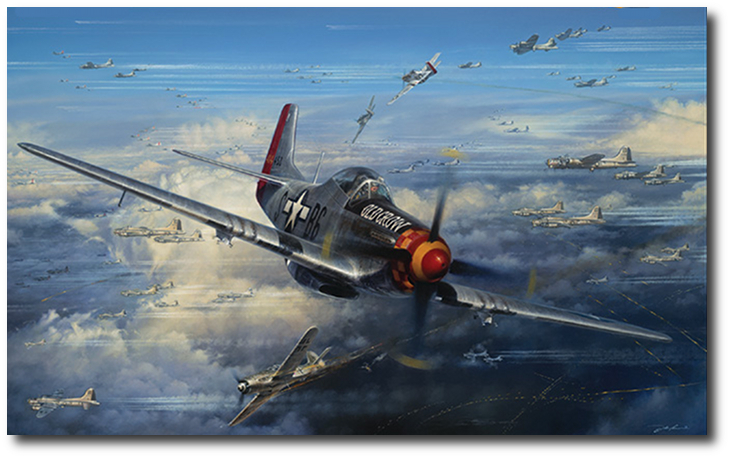 Shown here is famed triple ace Clarence E. "Bud" Anderson, flying his P-51D Mustang "Old Crow", defending B-17s of the 100th Bomb Group. As leading ace of the 357th FG's 363rd squadron, Anderson achieved the remarkable record of 116 missions without ever being hit by enemy aircraft fire.